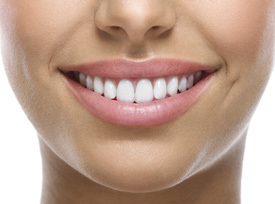 What does your smile reveal about you? Does it say self-confident or self-conscious? If you’re less than satisfied with your pearly whites, we are pleased to offer an array of cosmetic dentistry options to give you a confidence-boosting smile that you’ll be proud to show off! • ClearPath™ “invisible” braces are thin aligners that shift your teeth without brackets or wires. • Invisalign® orthodontics uses clear discreet aligners that are removable. • Quick Straight Teeth™ (QST) only focuses on straightening the front teeth that are visible. If you have teeth that are uneven, stained, gapped or discoloured, veneers can give you a stunning smile, provided you have healthy teeth and gums. These thin porcelain shells are bonded to the front of the teeth that are visible when you smile. Veneers, which also can be made of composite, can help you make that great first impression. You won’t need braces or whitening to achieve beautiful results. Do you have one or more missing teeth and dislike the idea of wearing dentures? If so, consider dental implants. Also called an artificial tooth root, which is made of titanium, an implant is secured into the bone next to your other teeth. Your body accepts this implant and creates new bone around it, firmly securing it into your mouth. Once this process of osseointegration has taken place, we can place a fixed restoration such as a crown or bridge on top of it for a lasting tooth replacement option. Tarnished teeth can leave you feeling less than confident about your smile. Coffee, tea, red wine and tobacco all can stain your teeth. The good news is we can offer dramatic whitening results in about 90 minutes, using our professional Zoom whitening system. Zoom erases deep stain particles within the porous surface of your teeth so your teeth will look many shades brighter. The results are long-lasting — up to two years! We also offer take-home whitening trays if you’d like to brighten your smile in the convenience of your home. If you want to smile with more confidence, our cosmetic dentistry options can help to enhance your appearance. Contact us today to book a consultation!